Welcome! Academie Duello Centre for Swordplay is a school of Western Martial Arts devoted to teaching the traditional martial practices of Europe. For a more in-depth discussion of all out taught weapons, take a look at the Our Arts page, and visit our Ongoing Programs page to find the best fit for you. Not interested in a long term commitment? Sign up for one of our Adventure Programs to try a one time only epic experience. Courses at Academie Duello take place at our convenient location in Downtown Vancouver, at 412 West Hastings Street, while all Mounted Combat programming is hosted at our partner stables, Cornwall Ridge Equestrian, located at 21955 14 Avenue, Langley BC. At Academie Duello our goal is to revive the rich martial traditions of Medieval and Early Modern Europe, and make them as vibrant and accessible as their Eastern counterparts like Karate and Kung Fu. This commitment to reinvigorating traditional Western martial arts is reflected in our curriculum, which is founded on the teachings of authentic combat manuals produced during the Middle Ages and Renaissance, covering a wide array of weapons and techniques used by the fighting men and women of those periods. Unlike many martial arts developed in the East, Western Martial Arts (WMA), also known as Historical European Martial Arts (HEMA), lack a continuous living tradition from their inception to the present. As a result, our work in reviving these arts is twofold: we research and explore the medieval and early modern primary-source texts of western martial systems, striving to accurately interpret the material through experimentation and dedicated practice. We then work to integrate these traditions with contemporary science on health and physical exercise to ensure that participants gain the maximum benefit from activity. It is also our goal to revive the spirit and ideals of these fighting systems, from the code of chivalry of medieval knights to the dueling etiquette of early-modern nobility. We believe that they do have a value in our contemporary society, by encouraging personal development and furthering respect amongst individuals of all walks of life. Participation in historical martial arts at Academie Duello is a vibrant contemporary practice, not re-enactment or role-playing. Our aim is not to pretend that we are people who live in a bygone era; rather, we believe that study and practice connects us with these martial traditions in a thoroughly modern way. In short, Academie Duello is more than a school: we are a Centre for Swordplay. We strive to educate the public about the rich and sophisticated martial traditions of Western Civilization, and to encourage scholarly research into martial arts and military history. Above all, though, we want to foster passion and inspire the pursuit of mastery in anyone who has ever been fascinated by these subjects. Arte is our dedication to martial arts as just that: an art form. We push ourselves to hone our skills as its practitioners, to study the primary-source combat manuals and learn from our teachers. 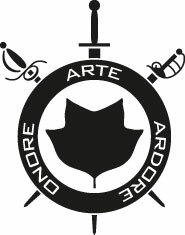 Ardore is our effort and passion for the martial arts that we practise, which we work to share with others and express in the diverse society around us. Onore is our honour, our respect for ourselves and each other as fellow students and teachers, from novices to masters and people of all backgrounds. It is also respect of the weapons that we wield, the martial systems themselves, and the power and ideas that they represent. Everyday at Academie Duello our classes perform the school salute, which involves the recitation of the motto. In doing so, we strive to keep the ideals of Arte, Ardore, Onore fresh in our minds, and keep us connected as members of a community. Welcoming | Academie Duello is inclusive and friendly. This is a place where youth of all backgrounds and abilities can engage with history and historical European martial arts. Physical | Students are sent home pleasantly sweaty and satisfied from our classes. This is swordplay in the real world not just in your heads. Fitness and activity are the keys to our physical well-being. Authentic | The arts we teach are based on a historic tradition. We honour this history by using historic training tools and by practicing a true martial art with the care and discipline expected by its first teachers. In turn we foster an environment for our staff and students to be their truest and best selves. Empowering | We give students the tools to be their own best teacher, and encourage them to realize their capabilities and their own personal power to shape their character. Professional | Our space and staff keep a polished, clean, and neat presentation. Classes start on time and run on a schedule. We do everything we can to make sure our customers have the most consistently excellent experience possible. Academie Duello was founded by long-time Western martial-arts practitioner and Master-of-Arms Devon Boorman and his student Randy Packer in 2004. At its humble origin, the school was a class of six individuals from the Western Martial Arts and re-enactment communities, who gathered on Monday evenings to practice the historical swordplay that fascinated them. After the initial class, a newcomer named Roland Cooper signed up as the first student of Academie Duello, where he has remained and since risen to become a Provost and instructor. The following week, two more students joined, and two more the week after that. As weeks turned into months, membership gradually swelled and class size rose as high as 40 students within the first year. Academie Duello then began to rent regular spaces for classes, first at Capri Hall on Fraser Street, and later at Kennedy Hall in Surrey. After a year of success, Academie Duello moved into its first permanent location on the second floor of Crown Square at the corner of Richards Street and West Hastings in Downtown Vancouver. The vast open space was excellent for accommodating large classes as membership continued to grow and the core programs became established. With the help of many dedicated volunteers, the space was refurbished and transformed into a genuine martial-arts school. But the growth did not stop there: over the next several years, with new instructors and staff, the school diversified its programs and workshops. A museum of Western Martial Arts and an arms and armour store were also opened to the public. The result: a dynamic, multifaceted destination for martial-arts enthusiasts, history buffs and more. In the fall of 2009, Academie Duello moved to its present, street-level location at 412 West Hastings, again to accommodate its increasingly large membership as a centre for swordplay. 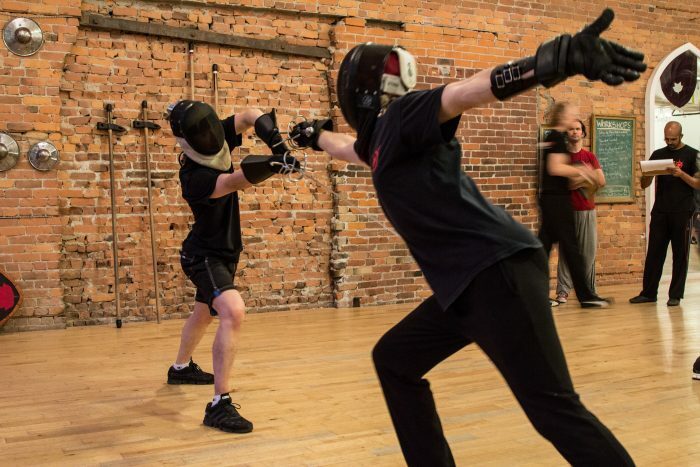 Now, with more than 1,000 members, over 200 active students in programs at any given time and more than 2,000 participants in classes and workshops each year, Academie Duello is the largest centre of Western Martial Arts in the world. Academie Duello has established a worldwide reputation as a destination throughout the WMA community, hosting the first Vancouver International Sword Symposium (VISS) in February of 2011. The conference was a great success, attended and lauded by masters, scholars and members of the WMA community from all over the world. More recently, Academie Duello made history as one the 23 founding members of the worldwide Chivalric Fighting Arts Association (CFAA). With an ever-growing membership and status as a respected institution in metropolitan Vancouver, Academie Duello looks forward to continuing its preeminent role in the bright future of Western Martial Arts. Founded in 2011, the Chivalric Fighting Arts Association (CFAA) is an international organization of schools and clubs devoted to the study of historical European martial arts, particularly those practiced in a chivalric context, used in war, the tournament, and the duel. Our member schools share a dedication to the revival of the fighting arts from the past, as well as a belief that the study and practice of these arts is a tool for building character and personal discipline – qualities that we believe can be of benefit to the modern world as much as they were for the ancient one. CFAA members study diverse martial arts – from lands ranging from Iberia to Britain, from the late Middle Ages to the early modern era, and including weapons ranging from the sword and buckler to the rapier. Ours is a fraternal organization, without a governing body, bound together only by our shared values, mutual support of our endeavours, and passion for ancient martial arts and their cultural milieu. More than 200 active members in a given month. More than 2,000 people participate in classes and workshops every year. Even more participate in our Adventure, Corporate, and School programs. The only swordplay centre in North America in a metropolitan downtown area. 5000 sqft downtown studio: 412 West Hastings Street, Vancouver BC. 12 acre farm and stables: 21955 16th Avenue, Langley BC. Best of Vancouver 2018: “Best place to live out a Game of Thrones fantasy.” Georgia Straight, published 10/03/2018. Academie Duello opens up the path to knighthood for disadvantaged kids, Vancouver Courier, published 06/18/2018. Swords and steeds: Richmond hosts mounted combat symposium, CBC News, published 09/10/2016. 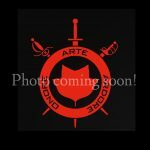 I Tried This: Swordfighting at Academie Duello, Georgia Straight, published 08/21/2016. B.C. swordplay academy slays fantasy by resurrecting art of knighthood, The Star, published 04/06/2016. 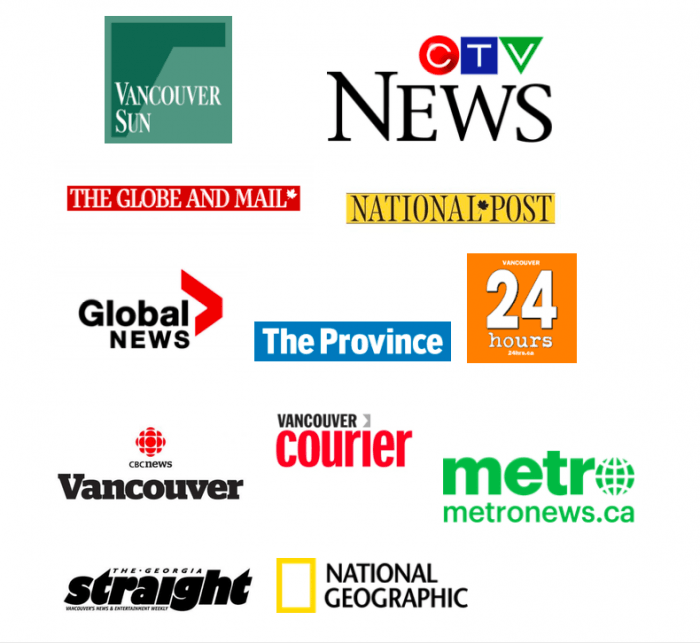 Swordplay Symposium attracts international crowd, Vancouver Courier, published 03/31/2015. Vancouver leads the renaissance in swordplay, The Province, published 01/26/2014. 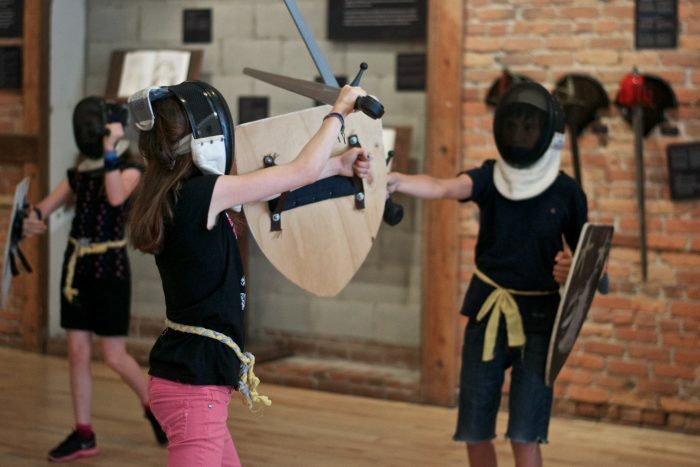 Medieval Bully Fighting Workshop, Global Morning News, published 02/16/2014. Game of thorns: Roseblade a longsword and the woman who wields it, Vancouver Courier, published 10/17/2013. Camp inspires youth with ‘knightly virtues’, 24 Hours Vancouver, published 07/01/2014. Charge into fitness with swordplay or martial arts, Vancouver Sun, published on 07/09/2012. En garde for the new fitness hybrid – SwordFit, The Globe and Mail, published 02/27/2011. Fully licensed images of our programs, activities, and facilities are available on our Flickr site in our Media album. Devon Boorman has been practicing martial arts since 1986. Starting first with Chinese and Filipino martial arts, Devon discovered western swordplay through the Society for Creative Anachronism (SCA) which connected him with a burgeoning community of martial artists and scholars studying Historical European Marital Arts throughout the world. Devon has traveled extensively, first as a student, then as a competitor, teacher, and researcher. He has won international tournaments, worked on both stage and screen as a stunt person and choreographer, and is the authour of two DVDs: Introduction to Italian Longsword, and Introduction to Italian Rapier, and a book by the same name, all available through Freelance Academy Press. Devon’s expertise centres on the Italian swordplay tradition including the arts of the renaissance Italian rapier, sidesword, and longsword, as well as polearms, wrestling, knife and mounted combat. He has taught workshops and seminars throughout the world on both the study and practice of historical techniques and on practical combat implementation. 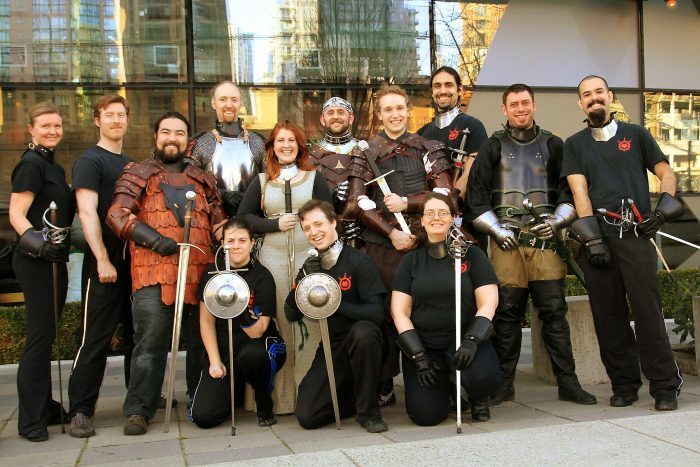 Devon is the co-founder and director of Academie Duello, which has been active in the Vancouver area since 2004. Under his leadership the school has become the largest school of its kind in the world with thousands of attendees in its programs each year. 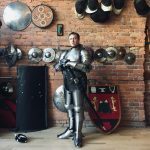 He is also the principle creator for Duello.TV the largest online academy for the study of Historical European Martial Arts with over 100 courses on swordplay and martial arts. Devon is a part of the Martial Advisory Council for the International Armizare Society and a research adviser for the journal Acta Periodica Duellatorum. 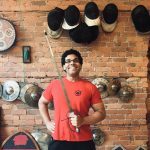 Miguel started practicing swordplay in the summer of 2012, and has followed the path of mastery in all three of our primary taught weapons (rapier, longsword, and sidesword). His attraction to HEMA is based on its connection to something real and historically authentic: “I was never drawn to modern sport-fencing because I knew that on some level it wasn’t as authentic as I wanted it to be. Personally, I’m quite interested in the Humanities, especially Anthropology and Archaeology, as well as the Arts. HEMA can fill much of that interest if framed and practiced properly”. Miguel decided to start teaching at the Academie as a means of challenging himself as a leader and as a way to further strengthen his own knowledge. Clinton started his swordplay studies at Academie Duello in 2004 and has since studied rapier, longsword, sidesword, and grappling. A general interest in swords led Clinton to start training at the Academie and, though he enjoys all our taught weapons, he has a slight preference for the rapier. Clinton eventually began instructing because he enjoys sharing his knowledge with others. Originally, Arturo started training Capoeira, but in 2016 he discovered Academie Duello and has been training here ever since. His favourite weapon is by far the rapier. According to Arturo, the most challenging aspect of HEMA is “staying on top of my practice. There is just so much information and things to do out there, and not enough Arturo to tackle it all!” In his time off the studio floor, Arturo is a programmer and loves to play with electronics. 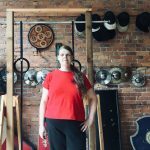 Tracey started practicing swordplay at Academie Duello in 2013, with virtually no prior experience in martial arts. She was inspired to get started by an interest in swords and the “mystique of the Age of Chivalry, through to the Renaissance”. Tracey feels that HEMA provides a great opportunity to learn about other time periods in a safe, contemporary environment. Becoming an instructor at Duello was a natural progression for Tracey, since teaching is a big part of both her professional and private life. She loves introducing people to new ideas and helping them develop new skills. At the moment, Tracey’s favourite weapon is the rapier, but she’s always changing her mind! Having previously studied Aikido and Ninjitsu for a brief time, Andre came to study at Academie Duello 11 years ago and was hooked. He was drawn to HEMA by an interest in swords, which he developed as an avid player of D&D. Andre’s favourite weapon is the rapier, as he is attracted to the key principle of keeping one’s opponent at the greatest possible distance. 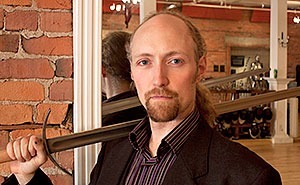 As an instructor, Andre’s goal is to help others find joy in the practice of swordplay. In his spare time, Andre enjoys computer programming, and playing RPGs. The history of Ben’s martial arts training is brief but intensive! He took his first class at Academie Duello in 2015, after noticing the Academie’s storefront by chance while walking home one day. For Ben, it was as if the heroes from his childhood storybooks had leapt off the page! He has always been interested in Knights, Chivalry, and swordplay, and Duello allows him to learn more about these subjects in a friendly, welcoming environment. Ben’s favourite weapon is the longsword, which brings to mind heroic deeds of the past, both real and imaginary. Though the longsword may seem easy to use at first, Ben has found that this weapon is deceptively complex. Ben loves challenging himself to master both technical knowledge and practical martial skill; he finds that thegap between knowing a technique and implementing it in a free sparring scenario can sometimes be a large one, but it is a very satisfying combination to pull it off! When Marli attended her first rapier lesson in 2013, she had no previous martial arts experience. 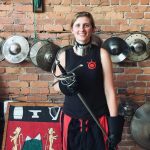 Like many of our first time students, she enrolled in Rapier Fundamentals by chance after acquiring a Groupon, but she continued practicing because she was attracted to the meticulousness of the art and the combination of physical and mental exercise. Marli’s favourite weapon is the single rapier, and she decide to start teaching this weapon because she enjoys sharing her passion and knowledge with others. She also finds, like so many of our instructors, that teaching is a great way to maintain and develop her skills as a practitioner.When Marli isn’t practicing or teaching swordplay, she’s in the lab studying viruses, playing with fiery friends, or enjoying cyberpunk on the screen and on the page. Matheus has been training at Academie Duello since 2011, and has studied all the weapons at the school. He believes that all the weapons are wonderful in their own way, but finds the sidesword to be the most beautiful, with the spear as a close second. Matheus decided to teach because, in his words: “Learning how to convey the Art is an extension of learning, in my path”. He feels that tournaments, similarly, are an extension of practice, because the encounter with different fighting styles, combined with the pressure of competition, different venue to learn. From The Princess Bride to The Three Musketeers, Audrey has always enjoyed watching swordfights and particularly duels; she loves watching characters square-off: parrying, lunging, dodging and, finally, striking!One day, Audrey watched a breathtaking dagger and rapier fight on television. When the scene was over she promised herself that she would learn how do the same thing, and after finding Academie Duello in 2014 that’s exactly what she did! Audrey’s favourite weapon is the rapier, for its elegance and precision, and because it pairs so well with her second favourite weapon- the dagger. Sheis currently taking her journey towards mastery one step at a time. For Audrey, the most challenging aspect of studying HEMA is learning how to combine physical ability with mental sharpness during sparring: strategizing, adjusting plans, and maintaining form, all while defending yourself and searching for an opportunity to strike. She finds it exhausting, exacting, and exhilarating all at once. 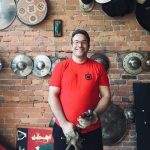 David needed a fun way to introduce physical activity into his routine, so he began swordplay lessons at Duello in 2011 and since then he has studied all our taught weapons! His favourite weapon is the sidesword because it effectively combines the longsword’s cutting abilities and reaction to binds with the presented plays of the rapier. David also competes on a regular basis at Swordsquatch, local tournaments, and tournaments in Portland and Seattle. He enjoys competing because it gives him a chance to meet new people and witness their individual expressions of the art, while also allowing him to test his skill. David decide to start teaching because “Duello means a lot to me and has given me a fun way to explore HEMA. It’s my way of giving back and showing others they can do HEMA too”. 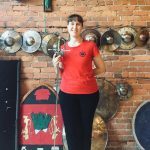 Emily began studying swordplay in 2015, starting with the longsword and sidesword but eventually branching out to study the rapier as well. Her goal is to continue learning and stay active. She decided to start teaching in order to challenge herself in a new way, and she loves the look of accomplishment she so often sees on her students’ faces. Emily’s favourite weapon? All of them. Aaron’s previous experience with martial arts is a mixed bag: he has practiced Taekwondo, Krav Maga, and kickboxing, and has also studied Olympic fencing. In 2008 he began studying HEMA because, as an avid player of the Legend of the Zelda, he’d always wondered what it would be like to wield a real sword! 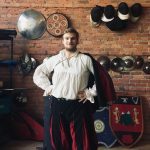 Having trained at Academie Duello ever since, Aaron views the school as a leader in the instruction of medieval and Renaissance swordplay, and a force for positive change in the lives of its students. Aaron began instructing because “A friend asked me what I would do if I could do anything. I told her ‘I’d teach swordplay, and share how happy and strong it has made me’”. At the age of 10, Fraser enrolled in our Knight Camp program and has continued studying HEMA with us ever since, learning rapier, sidesword, sword and shield, longsword, and polearms. Fraser now helps instruct during Knight Camp because, as a former attendee, he has an excellent grasp of the program’s strengths and weaknesses, and is able to contribute to making Knight Camp as fun and engaging as possible! In his spare time, Fraser plays the bagpipes, does forging and metalworking, and studies physics and engineering. Adrian started Olympic fencing at the age of 8, studying foil for four years and epee for ten. He decided to try the rapier at the suggestion of a friend, and enjoyed the emphasis on attention to detail, as opposed to winning. That said, Adrian has competed in many rapier tournaments and loves the singular focus which competition demands. Though he has always been interested in swordplay and combat, Jordan wasn’t sure, at first, how to get involved in the HEMA community. As luck would have it, he discovered Academie Duello by chance. It was curiosity which led him to sign up for one of our Fundamentals courses but, as Jordan puts it: “the incredible welcoming environment and the aspiration toward excellence at Duello are what keep me here. Everything that was missing in my childhood dalliances with martial arts was found here”. Jordan finds great satisfaction in reaching new goals as a practitioner, and hopes to one day be a Master. He decided to become an instructor because “simply put, I love teaching. I want to help guide others in this martial art just as Duello’s instructors have helped me in the past and continue to help me now”. Jennifer is the head of Academie Duello’s Mounted Combat program, located at Cornwall Ridge Equestrian. She has been riding since before she could walk, and her first complete sentence was “I want a horse.” In high school she and her best friend used to fence with riding crops, so in retrospect, it is inevitable she would end up finding a way to combine swords and horses in her life. Academie Duello is a diverse and inclusive space that welcomes any person to participate in our classes and in our community. It is an environment supportive of every individual’s dignity, well-being, and personal goals. Academie Duello students, instructors, and staff members value difference and diversity and are committed to providing a working and learning environment that is respectful, professional, and free of bullying, harassment and discrimination. All employees, instructors and students at Academie Duello have the right to work and train in such an environment. Bullying, harassment and discrimination are neither acceptable nor tolerated at Academie Duello.